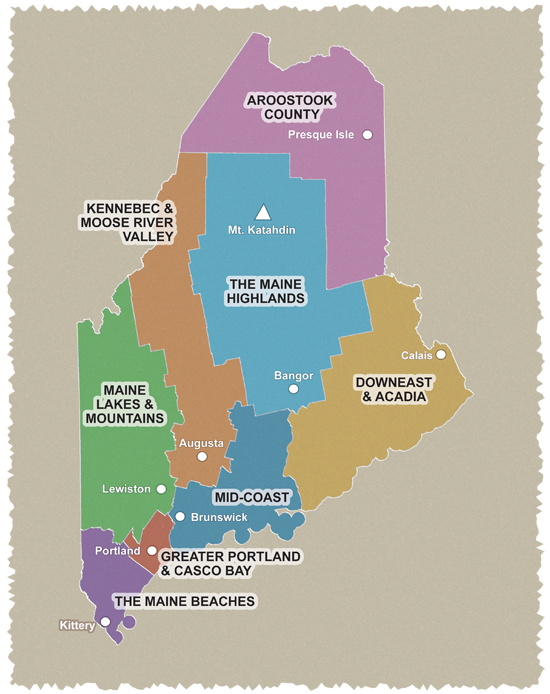 Spectacular coastal scenery, expansive sandy beaches and charming New England villages mark the Southern Maine Coast. Cyclists will travel through the historic coastal towns of Wells, The Kennebunks and Old Orchard Beach. These gentle 27- and 48-mile rides begin and end in the summer vacation town of Old Orchard Beach, a town with a wonderful white sand beach and a bonafide old-fashioned amusement pier. From there cyclists travel inland along the lovely Saco River and through rural farmland. The 21-mile loop includes the villages of Kennebunkport and Kennebunk. The 34-mile loop takes you on Ocean Avenue, a beautiful ride along the coast of Kennebunkport. The leisurely 49-mile route has broad appeal. Beachcombers and sun worshippers will be thrilled with the many beaches along the way. History buffs can choose between museums and many other sites in the historic towns on the rides. Historic Kittery (the oldest incorporated town in Maine) has many historic sites and spectacular views of the Piscataqua River and Portsmouth Harbor. The roads in the Kittery coastal area are a cyclist's paradise. They feel as rural as the middle of nowhere, yet they’re in the midst of a tourist hotspot where there’s a world of fun for the whole family. Great beaches, historical treasures to explore, the best seafood, and great shopping offer something for everyone.